“Mike” grew up in Arizona and went to Ray H.S. (1960-1964), where he lettered all 4-years in football, basketball, baseball, and track. He received his B.A. from ASU and a Masters from the University of Arizona. After a short coaching stint at Mayer H.S., he started coaching at Marana High School in 1974 in football, and baseball. 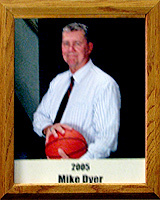 In 1977, he took over the girls basketball program where he coached for 20-years until he retired in 2003. During his time as head coach, his record was 400 wins, and 151 losses (73%). He won 12-league championships (1980-1991); 9-regional championships-’82, ’85, ’88, ’89. Besides being an active coach, he served as a board member of the Arizona Coaches Association for more than 35 years. He was the regional-8 Rep to the National Coaches Association. From 1983-1989, he served as an Advisor to the Arizona Medical Association for Sports Medicine. Michael has been named Regional Coach of the Year ten times; Arizona Republic Coach of the Year in 1981; ACA All-Star Coach four times and is enshrined in both the Arizona Coaches Hall of Fame; as well as the National High School Coaches Hall of Fame. Michael and his wife Rose, have three children. Prior to becoming a teacher and coach, he had a brief career in the military, serving in Vietnam where he received 3-Purple Hearts for his effort. In 1998, the Northwest Explorer News recognized Michael as a finalist for its Citizen of the Year Award.